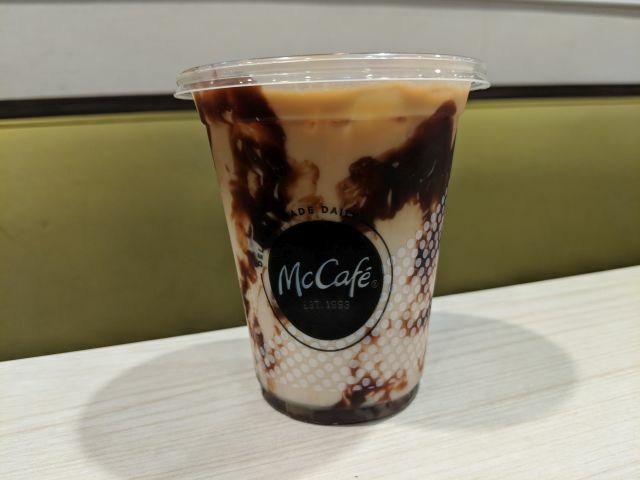 McDonald's Iced Turtle Macchiato features turtle syrup layered with milk, ice, and espresso, topped with chocolate drizzle. A small 12-oz cup cost me $2. While there was a nice visual appeal with the layering and chocolate drizzle, the chocolate syrup doesn't stir into the drink very well and it's not as if you can shake the cup without it spilling. This left me with a few unpleasant and very sweet sips as there are some harsh notes to the syrup when taken alone. The coffee was slightly thickened with the condensed milk in the turtle syrup, which also served to make it creamier. Beyond the extra creaminess, the coffee flavor was pretty mellow with a good balance of mild chocolate and caramel notes (as long as I avoided the layer of syrup that accumulated at the bottom). Taken altogether, McDonald's Iced Turtle Macchiato turned out to be decently enjoyable although I imagine it would be too sweet if you actually managed to incorporate all that extra chocolate syrup clinging to the sides and bottom of the cup.